This chowder was the perfect fix this week! I’ve been fighting a nasty cold and of course when one person in the house is sick…everyone gets sick. A warm, rich and comforting meal is exactly what we needed last night. Being that my girls stayed home from school, I had the whole day to tend to them, and scheme up some sort of warm reward for all of us sickies before heading to bed. I went to the freezer and pulled out a smoked ham. When we first picked up our meat from the smoker late fall we were excited to cook up a big ham dinner. To our surprise, the ham seemed overly salty and while we were grateful for our home grown ham we were slightly disappointed with the over powering salty flavor. We only opted to smoke the bacon (which is AMAZING) and a few picnic hams. After one disappointing attempt I decided to rinse and then boil the ham this time around. Once the ham was fully cooked, I sliced it up, using half for this recipe and saving the other half for ham salad to keep for lunches throughout the week. 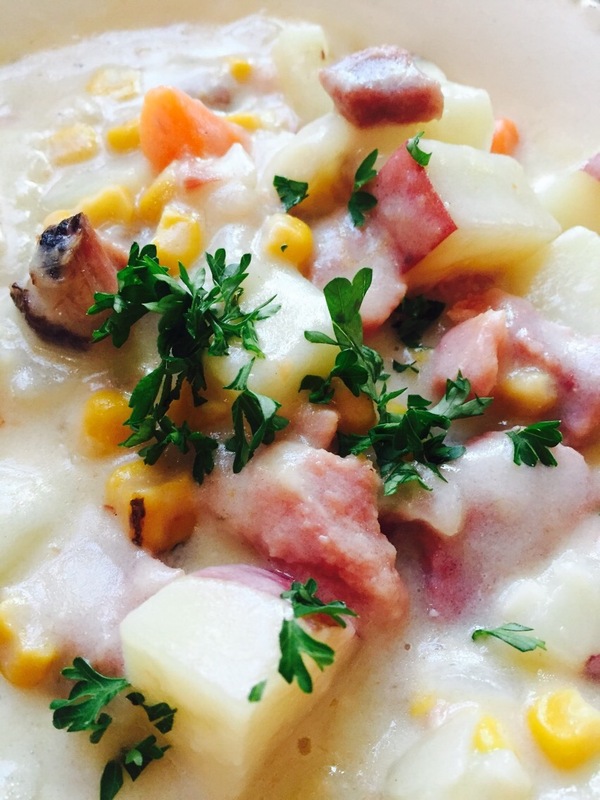 This chowder can easily be done with a simple ham steak, cubed, as well. 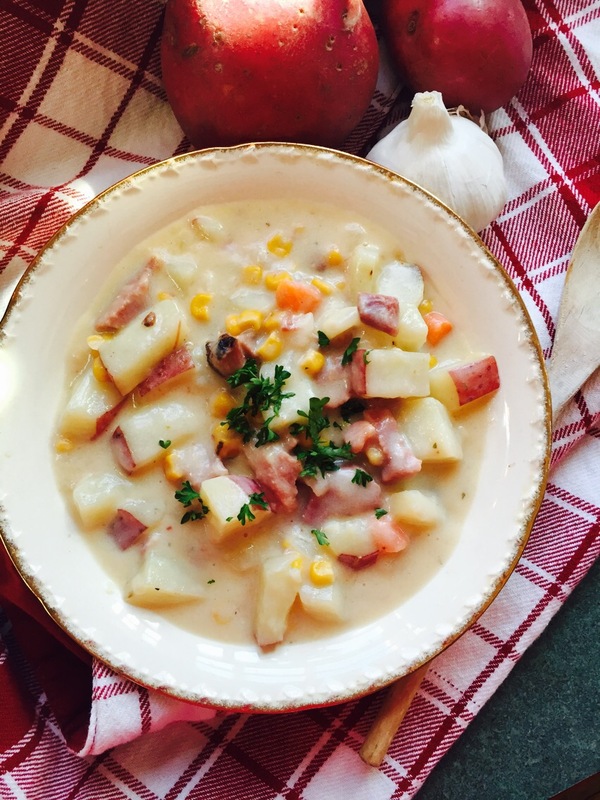 I was so pleasantly surprised how rinsing and boiling the smoked ham took away the overpowering salty bite… Leaving our farm fresh, yard to table ham tasting succulent and perfect in this creamy corn chowder! 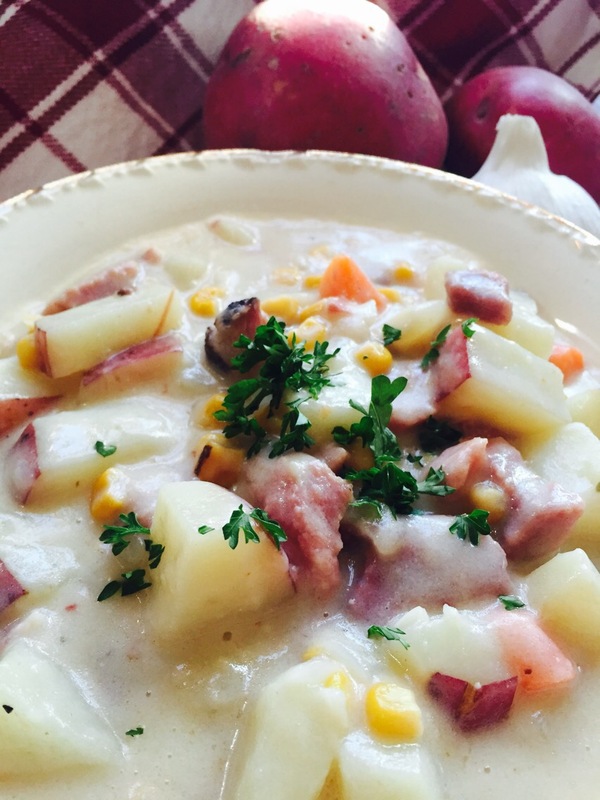 This chowder is the perfect prep ahead meal! It was so nice and sunny yesterday… The windows were open, it was a balmy 38 outside after all, and I figured… Crank up the woods stoves, open up the hatches and get those germs out! 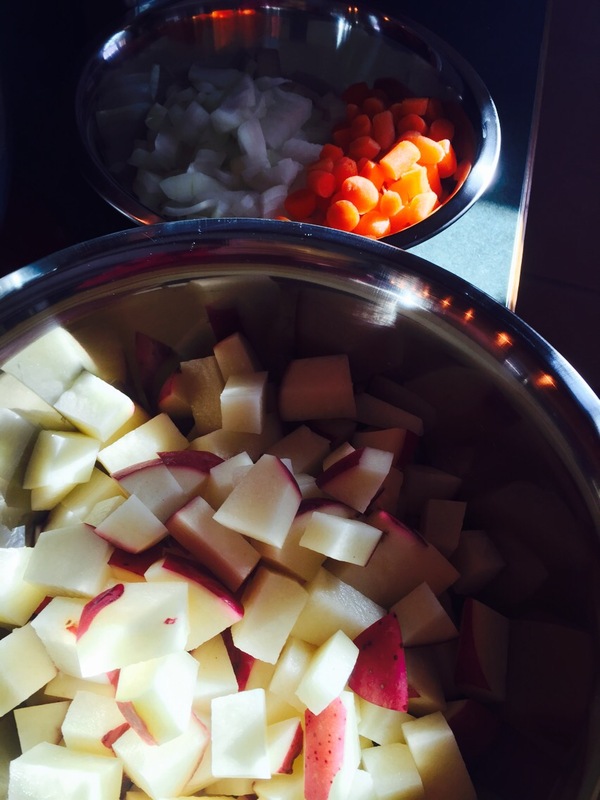 Dice up all your potatoes, onions carrots and garlic. In a heavy ceramic dutch oven, or whatever soup pot you prefer, fry up your bacon or pork belly over medium high heat. Add your onions and carrots to the bacon grease and cook for 3-4 minutes, stirring frequently. Season with a pinch of salt and pepper. Once translucent, add in the garlic. Cook for another minute or two. Next add the flour. Toss to coat and cook the raw flour, stirring constantly for 1 to 2 minutes. Next add the milk, water and bouillon cube. 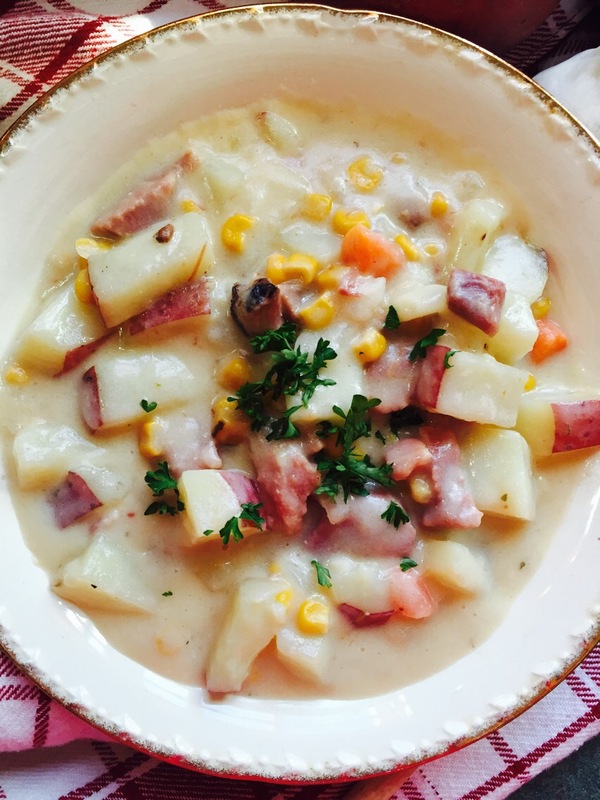 Add your ham and potatoes…bring the chowder to a simmering boil. Add your cheeses and stir until melted. Add the corn, stir and then cover. Simmer on low for 30 minutes or until the potatoes are tender. Stir every so often to be sure nothing is sticking to the bottom of your pot. This is a startchy dish after all. After the potatoes are tender, the broth should be thick and creamy. Serve it up and enjoy!!! This is a soul satisfying meal!